Want to give your prints a distinguished and classic look? Then Superchrome is the perfect place. Superchrome is a UK based digital printing company, specializing in large format prints. We have years of rich experience in providing large format printing solutions to all our clients within the nation and overseas. With state of the art technology and timely delivery of products, our company has achieved a world-class reputation in this competitive field of large format printing. Our company helps you to maintain the visibility that you need. Superchrome has state-of-the-art large format canvas printers for printing movie posters, event posters, event flyers, advertisements, photo enlargements, art canvas prints, adhesive photos, group photos and more. We use special 8 or 12 color ink-jet canvas printers for creating large format print. Our canvas format large printers can produce prints up to 44” in width and infinite length using rolls of canvas. At Superchrome, we are equipped with the latest technologies to produce vibrant photo realistic prints. With our canvas format large printer, we can print your artwork or photos at optimal resolution on high quality canvas including water resistant canvas, fast dry matte canvas, fast dry glossy canvas, and coated cotton canvas. We use pigment-based water resistant inks and UV protected inks for long lasting results. We offer the best color reproduction with high quality finish. 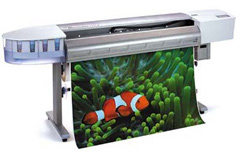 Our large format canvas printer ensures vivid photo quality results. We have the capability to print the images in varying sizes and shapes as per your needs. At Superchrome, we have multiple packages available in various price ranges for printing using large format canvas printers. We have experienced friendly professionals who exceed the expectations of our clients. Our team will also give care and utmost attention to the stretching and framing of the canvas prints. We have measurable advantages for our customers which include - faster turnaround times, low per-print prices, simplified file transfer process, and stunning professional quality. Take full advantage of our printing services. Utilizing our online service you can share your thoughts and tastes about prints you want from us. To know more about our services, please log on to our website. You are also welcome to give us a call or send us an e-mail. If you would like to know more about canvas format large printer, any of the projects shown or if you want to discuss any project you have coming up then contact us 020 7237 9333 or fax 020 7237 9444 or email sales@superchrome.co.uk. Our experienced personnel would be able to guide you appropriately.